1930-31 Model A Ford bottom hinge. This will fit either driver or passenger sides. Fits all Coupes, Tudor Sedans, and Closed Cab Trucks. 1930-31 Model A Ford middle hinge. This will fit either driver or passenger sides. Fits all Coupes, Tudor Sedans, and Closed Cab Trucks. 1930-31 Model A Ford top hinge. This will fit either driver or passenger sides. Fits all Coupes, Tudor Sedans, and Closed Cab Trucks. 1928-29 Coupe/Tudor Door Lower Hinge. Hinges are supplied in a cast unfinished form. You will ned to drill and tap all mounting holes. Fits driver or passenger side. Cast bronze. Not the best quality, find some good originals if possible. 1928-29 Coupe/Tudor Door Middle Hinge. Hinges are supplied in a cast unfinished form. You will ned to drill and tap all mounting holes. Fits driver or passenger side. Cast bronze. 1928-29 Coupe/Tudor Door Upper Hinge. Hinges are supplied in a cast unfinished form. You will ned to drill and tap all mounting holes. Fits driver or passenger side. Cast bronze. S/W Hinges, hinge on cowl 1930-31. Cast bronze hinges with only the hinge pin hole machined. You will need to drill and tap mounting holes. These fit the Victoria and the Slant Windshield 4-doors. S/W Hinges, hinge on door 1930-31. Cast bronze hinges with only the hinge pin hole machined. You will need to drill and tap mounting holes. These fit the Victoria and the Slant Windshield 4-doors. Set of nine of the small headed 5/16-24 x 1/2" screws which is enough for one door. Three screws per hinge, to fasten the door hinge to the door, on the closed cars. 1928-34 Hinge to Body Screw Set. This is a set of 3 screws which fastens the closed car door hinge to the body. Made in USA. 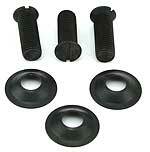 Hinge screw washer set for the 1928-31 Model A ford door hinge. Set of nine internal star washers that are used under the heads of the hinge screws. For 5/16" screws. Made in USA. Standard size hinge pin with the round head. 1 5/8" long, authentic for the closed cars (size .233/.236). These fit 1928-31 closed body styles except Slant Windshield cars. Zinc plated steel. Made in USA. Oversize hinge pin with the round head 1 5/8" long, authentic for the closed cars (size .247/.250). Stainless hinge pin 1928-31. This stainless pin is knurled with a polished head. Fits the Model A Coupes, Tudors and Pick-ups. 0.247" diameter, 1.830" long. This is the correct hinge pin for the 1930-31 Slant Windshield Model A Fordor Sedan. Made in USA. 0.279 diameter, 1.750" long. Open car Hinge pin set 1928-31. 100% authentic hinge pins for the Roadster and the Phaeton 0.230 diameter, 1.812" long. Set of 4. (You will need two sets for a phaeton) Made in USA. Hinge Pin for the 1932-48 Ford in polished stainless steel, Extra Long 2.70" x .28"
Door hinge set for the 1928-29 Roadster or 4-Door Phaeton Front Doors. The upper and lower hinge for both sides of the car. Enough in a set to do both the driver and passenger side doors. Open car & Roadster Pick-up only. Door hinge set for the 1930-31 Roadster or 4-Door Phaeton Front Doors. The upper and lower hinge for both sides of the car. Enough in a set to do both the driver and passenger side doors. Open car & Roadster Pick-up only. Made in USA. Door hinge set for the 1928-29 4-Door Phaeton Rear Doors. The upper and lower hinge for both sides of the car. Enough in a set to do both the driver and passenger side doors. Open car & Roadster Pick-up only. Made in USA. Door hinge set for the 1930-31 4-Door Phaeton Rear Doors. The upper and lower hinge for both sides of the car. Enough in a set to do both the driver and passenger side doors. Open car & Roadster Pick-up only. Open car hinge screws 1928-31 door to hinge. This kit mounts the door to the hinge on all 28-31 open cars. Need 1 kit per door. Made in USA. Open car hinge screws 1928-31 hinge to door post. This kit mounts the hinge to the door post on 28-31 open cars. 1/4" bolts. Need 1 kit per door. Made in USA. Some of the 1930-31 Roadsters used a 5/16 bolt rather than the 1/4". This kit has 6 screws. Need 1 kit per door. Mounts the door hinge to the post. Made in USA. 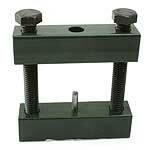 This drop forged tool with three graduating hardened push pins will push your old hinge pins up and out of the hinge. As the bolt is screwed in, it will push the dowel and the old pin out. Three different length push pins are used to remove pins. Start with the short pin and work your way up to the long pin. The "C" clamp opening is 2 3/4", The pin diameter measures 0.230"
WILL NOT WORK ON OPEN CARS i.e. ROADSTERS AND PHAETONS, OR 1931 SLANT WINDSHEILD CARS. H/D Hinge pin tool for the 1928-31 Model A. A handy tool for removing the door hinge pins. Comes with instructions. Comes with correct 7/32" dowel pins for pushing model A hinge pins. Made in USA.